It's been years since I last dined in Racks. It is a local restaurant well-known for its off the bone ribs and unparalleled barbeque sauces. When I found out that they have recently opened a branch in Sta Rosa (which is closer to home), I just had to go there with my family and indulge in a feast! RACKS Paseo de Sta Rosa's interior pairs bright colors with natural earth tones and mid-toned wood furniture, giving it a warm, homey feel. Our degustation started with a salad. The Classic Caesar Salad, family size (P 350) was just perfect with its crisp combination of romaine, croutons and bacon bits drizzled with a rich Caesar dressing. 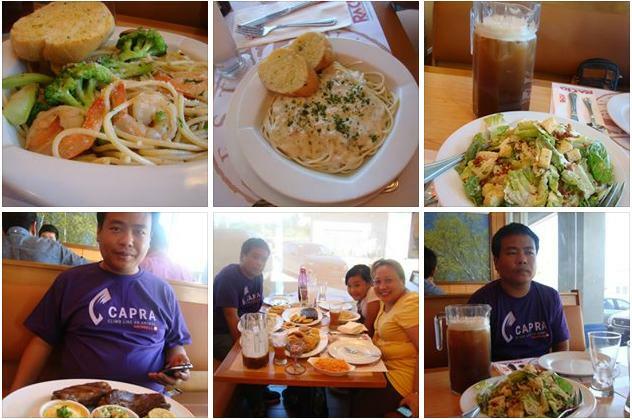 For pasta, we ordered Garlic Scampi Pasta (P 295) and Carbonara (P 250, single serving). The first one is a garlicky Italian-American seafood dish over an aldente linguini pasta. The flavors were done right and I love that it comes with steamed broccoli pieces tossed in. My daughter's creamy Carbonara turned out perfect! She liked it so much that she finished her comfort food all too quickly by herself. RACKS is also known to make the best Fried Chicken of all time and so my daughter didn't pass up on the opportunity to try it. The Southern-style Chicken (P 380 for half order) comes with Flaky ‎Buttermilk Biscuits‬ and Honey on the side. The chicken portions are big. Each piece comes with a perfectly crunchy seasoned crust that gives it a savory flavor. The chicken coating has that right amount of crispiness we all crave for. Racks Classic Pork Ribs (P 315) is an absolutely gorgeous slab of tender, meaty pork ribs flame-grilled to perfection! The moist ribs slides off of the bone easily. Racks Premium Boneless Pork, Quarter(P 370) satisfies the craving for baby back ribs minus the bones! These delectable short ribs are best paired with potato salad or macaroni and cheese. My husband was craving for rice and so I asked if they serve one though I couldn't find it on the menu. Well, they actually have plain and java rice offerings I learned. ‪‎RACKS also serves delish desserts. The Mississippi Mud Pie‬ is a real chocolate lover’s delight! The rich, chocolatey cake topped with Vanilla Ice Cream sits on layer of warm, melted chocolate. What an awesome way to cap a heavenly meal! It is refreshing that Racks added a few changes on the menu. You'll be glad to know that on top of the original and spicy barbeque sauces, RACKS now sells frozen packs of ribs which you can heat and serve at home for dinner or for parties. Do drop by RACKS Paseo de Sta Rosa soon for refreshing, tender meals. Their courteous staff will be glad to help you with your food choices.